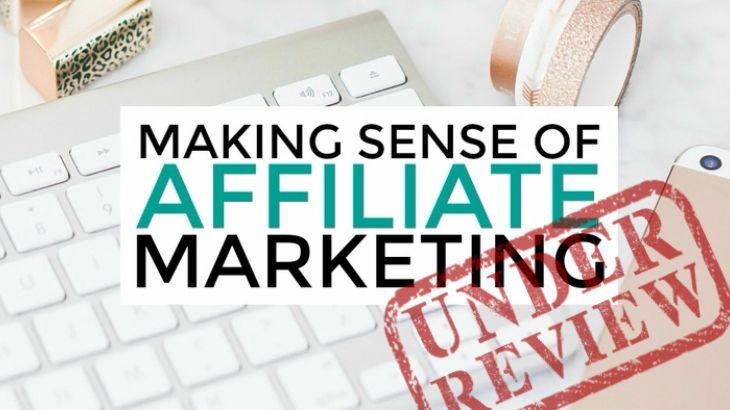 Making Sense of Affiliate Marketing Review: Is it really worth the price? →Making Sense of Affiliate Marketing Review: Is it really worth the price? Are you looking for ways to make money online via affiliate marketing? Or are you struggling to make money from your blog because you don't fully understand how affiliate marketing works and how to do affiliate marketing effectively? Well, these are the 2 possible reasons why you landed on this Making Sense of Affiliate Marketing review. I'll break down this course for you and tell you exactly whether this is for you depending on your situation right now. By the way, for those of you who are new to affiliate marketing (which I assume is YOU), you might be interested to check out my Step-by-Step Affiliate Marketing Guide in 2018 (and beyond)! Summary: Making Sense of Affiliate Marketing is a very detailed step-by-step course to help bloggers monetize their blogs via affiliate marketing. However, the course may be too basic for more experienced bloggers and it's also not suitable for people who don't have a blog/website in the first place. For complete beginners who yet to have your own blog/website, START HERE! Making Sense of Affiliate Marketing is an online course created by Michelle Schroeder-Gardner and it is delivered via the platform called Teachable. The main goal of this course is to help bloggers and website owners to monetize their sites through affiliate marketing. Michelle is a very experienced blogger and affiliate marketer. She has an award-winning blog called Making Sense of Cents. There's a famous income report category on her blog where she documents all her monthly and yearly income details. She had made $1.5 Million through her blog in 2017! That's crazy! 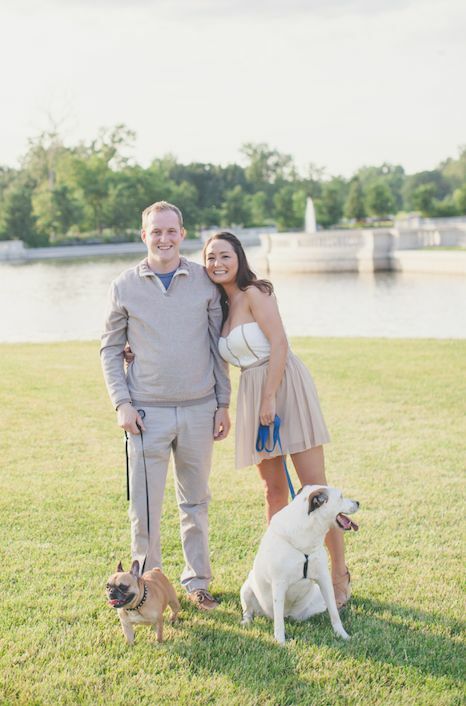 One of my affiliate marketing idol, Pat Flynn, made $2 Million online in the past 12 months. 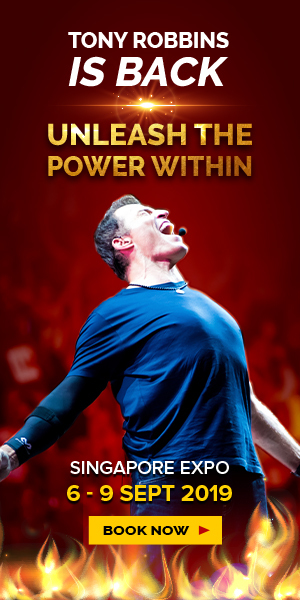 But Pat is now a world renowned speaker. While Michelle may not be as experienced and well-known as Pat, she is making $1.5 Million just through her blog! This is insane. But at the same time, this shows that there are a lot of things we can learn from her as well as her course, right? In this course, there are a total of 6 modules which include over 30 lessons, several worksheets, bonuses, an extremely helpful and exclusive Facebook group, and more. Module 2: How to Find and Apply to Affiliate Programs? Module 4: How to Get Your Readers to Convert? Check out the main website here if you want to learn more details about the course. I know it's hard to actually understand what you're going to learn by just looking at the titles of their different modules and bonuses. How to repeat the process that is working and scale up your affiliate marketing business and revenue! That's basically what you can expect to learn from Michelle's Making Sense of Affiliate Marketing! I'm not going to say Making Sense of Affiliate Marketing is for anyone who wants to make money online via affiliate marketing because we are all on different stages in our journey. Before you decide whether this course is for you, you need to first understand where you are right now. For example, some people have a blog but are just struggling to make money from it. They will certainly benefit from Making Sense of Affiliate Marketing and potentially scale up their blogging business right after going through the course. On the other hand, there are many people who are just looking for ways to make money online. They don't have their own blog right now and just want to get started. Making Sense of Affiliate Marketing is not a course to teach you how to set up your own blog so this course is definitely not suitable for this group of people. No Blog Yet? I've Got Your Back! P.S. 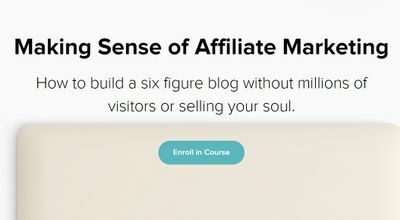 Making Sense of Affiliate Marketing is mainly to help bloggers monetize their blogs. So it will not be as helpful for people who are simply building a niche-specific website, although there are still valuable lessons to be learnt. Making Sense of Affiliate Marketing is indeed a very comprehensive course. It not only covers the basics, but also give quite a lot of valuable tips and strategies which are easy to follow and implement. Not only that, it also covers the part about the legal aspects of affiliate marketing which I feel is pretty helpful because not many places really teach this topic clearly. The main support of this course comes from the Private Facebook Group for all the members. But you might be wondering, how many Facebook Groups were just dead or get abandoned after some time? We have all came across Facebook Groups that are not active at all or the purpose of the Group is just to post links, right? Well, although Michelle doesn't provide any other forms of support, she is crushing her Facebook Group. Both Michelle and her members are pretty active inside the Private Facebook Group and you can really learn a lot by actively participating in the group. It is rare to see a founder being so active inside the community. For what you'll receive and learn, I think $200 is a very reasonable and affordable price. Michelle is honest and straightforward because she doesn't hide anything in her course in order to promote another upsell. $200 is a one-time investment for this course and you'll have a life-time access to the course content as well as the community, which is pretty awesome. By the way, Michelle does update the course content whenever it's needed. So you won't be learning outdated content! Michelle is just an ordinary person who graduated from College with lots of student loan debt. But she was able to clear all the debt and start living a truly freedom lifestyle with her husband within a few years time. This is all made possible because of her successful blog, Making Sense of Cents. Just take a look here at how many awards, mentions, features and interviews she has received for her blog. It's crazy! It shows Michelle definitely knows her stuff and there are things we can learn from her - an ordinary girl doing something extraordinary and making $1.5 Million from a blog in a year! There's nothing to lose when there's a 30-Day Refund period, isn't it? Making Sense of Affiliate Marketing is a text-based course with screenshots attached. The advantage of this is that you can go through the course at a faster speed. But the downside is that it upsets people who love to learn by watching videos. The good thing about the screenshots is that Michelle actually includes quite a lot of screenshots from her own blog. So you can see exactly how she is doing it and how it works. At least that's a good compensation for no videos. I know I've said that the course is comprehensive. But if you're a more experienced blogger or marketer and you have been making some good income online, you may feel that the content of Making Sense of Affiliate Marketing is too basic. There are more advanced platforms like Stack That Money. So if you're an experienced blogger and affiliate marketer, you may want to look into Stack That Money because there are more advanced contents in this community. There are worksheets provided within the course but you can't fill it up online. You need to print it out and physically jot down your notes. This may be inconvenient for people who have no printer at home or people who just prefer to do everything online. Now comes to the most important part. Like I've explained earlier, Making Sense of Affiliate Marketing is for those who already have a blog of their own because it doesn't teach you anything about setting up your own blog. 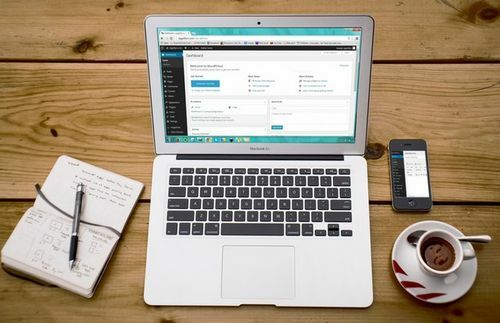 If you already have your own blog but you don't have a topic for your blog yet, this course is not going to help either because they only focus on the affiliate marketing part. There are also different ways to approach these topics. Unfortunately, Making Sense of Affiliate Marketing doesn't cover this part as well. Is Making Sense of Affiliate Marketing a Scam? Making Sense of Affiliate Marketing is NOT a scam. Michelle did a really good job at covering most of the important aspects in affiliate marketing. There are a lot of things you can learn from her through the course as well as the Private Facebook Group. Is Making Sense of Affiliate Marketing Worth the Money? Or is it for me? I think paying $200 for such a comprehensive course is worthwhile. Firslty, $200 is a really affordable price. Secondly, if you take action from what you learn in the course, you can make a lot more money in just a few months' time. But the pre-requisite of this course is that you need to have your own blog in the first place. Not only that, you need to know your niche and have a group of target audience. So, if you're currently a blogger or a website owner and want to monetize your blog/website through affiliate marketing, this course is for you and it will worth the investment. This course is also for those who have been making some money from your blog (let say a few hundred or thousand dollars per month) and you want to scale that up. For this group of people, you might feel some part of the course is too basic for you but there are parts which can be really useful to help you level up your game. However, if you fall into the category that you don't have your own blog yet, Making Sense of Affiliate Marketing is not for you right now. It doesn't teach you about how to build your own blog/website and how to choose your niche. Without these 2 in place, it's hard for you to benefit from this course. The first step to making money from affiliate marketing is to have your own website. Unfortunately, Making Sense of Affiliate Marketing doesn't teach you that. But I've got your back! Wealthy Affiliate is my recommendation for you! It is a community which not only teaches you everything you need to know about affiliate marketing, but it also gives you the technical support to build your website. Wealthy Affiliate provides you with state of the art web hosting and allows you to build your websites for FREE in the beginning. You can literally create your own WordPress website within a couple of minutes. No coding, programming or any complicated things involved. Even my 80-year-old grandma can build a website at Wealthy Affiliate without a problem. 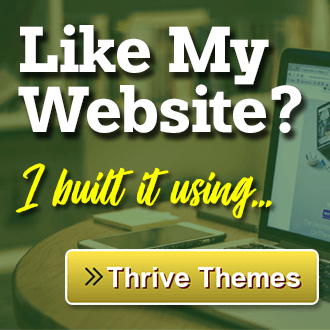 BUILD YOUR WEBSITE @ WEALTHY AFFILIATE NOW! A very informative review about Michelle’s blogging course content. I’ve been on Michelle’s list for a little while and having looked at her business model it’s easy to see why she has become super successful in a relatively short period of time. Michelle publishes her monthly income, which is becoming more and more popular in the blogging world, and you can see that she has around a dozen or so sources of income but two in particular make her the most money. One is this blogging course which she promotes to her tribe of followers (and seeing she is the course creator and owner she keeps ALL the money) and the other is an affiliate commission she makes by using her affiliate link to a particular hosting company that her followers are encouraged to use at the start of their blogging journey. In fairness, it’s a simple but brilliant recipe for building an impressive monthly income and one which is completely legitimate! I enjoy reading your various reviews, this included, and am confident you’ll do very well given the amount of time and effort you put into it. I love seeing young people treading their own path and going into entrepreneurship rather than the tried and trusted school, college, job route. Well done and every success to you. 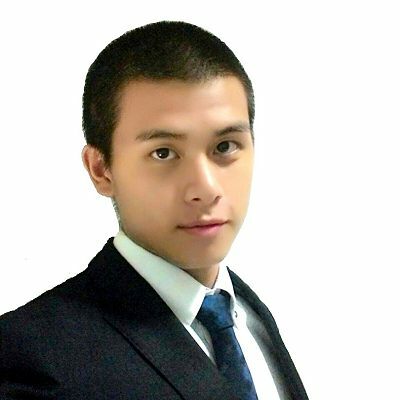 Awesome article man, I am following your blog for my queries related to affiliate marketing business. It is quite helpful for me and I want to learn more. Can you tell me where to purchase the genuine guide to get some knowledge? I’m glad you found my blog helpful for your affiliate marketing business. I don’t really understand what “genuine guide” are you talking about? 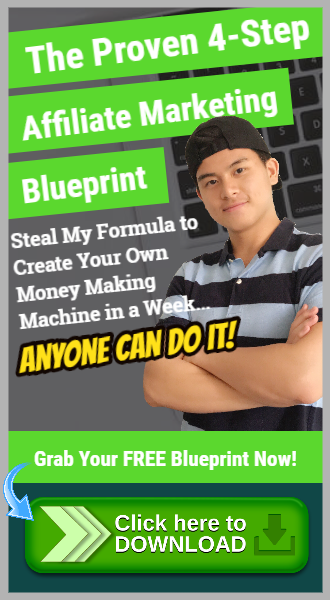 You can click here to get my 4-Step Affiliate Marketing Blueprint or click here to join the my top recommended affiliate community! How come every time I got Wealthy Affiliate members hijacking other product reviews? Hi Adam, what do you mean by hijacking other product reviews? By the way, I’m reviewing products based on my honest opinion. Couldn’t you see that from all my unbiased review? I’m sure everyone has their favorite tools/products so do you. In my case, Wealthy Affiliate is my top recommended platform. Jerry, it is so amazing of the amount of money that this woman made alone in 2017. In fact, I think this is the same lady that I read about sometime back that made three hundred thousand dollars from one blog post. She really is riding high and making some real real real good money. But as you have pointed out the cons and that is a part of her program may make it difficult for some. I believe that with Wealthy Affiliate training, you get a total breakdown of this business and have all the tools and help you need to build a successful online business. The price here at Wealthy Affiliate is really great for all that we are getting. It was my first time hearing about this lady when I came across this course. But her results are really mind-blowing. Anyway, I think Wealthy Affiliate has a more comprehensive resources for anyone to build an affiliate marketing business. For Making Sense of Affiliate Marketing, there isn’t any other tools and resources to help students in their business. Hi Jerry, once again you have delivered. This is an excellent recommendation of work produced by a lady who obviously knows what she is doing. As a blogger who has only just entered this arena, I am inspired. Not only by what Michelle has accomplished but also the outstanding work that you give your readers always.